The internet is growing and innovating at breakneck speed, disrupting many established industries and changing how we communicate, conduct commerce, consume entertainment and news, and interact with government. Perhaps unsurprisingly, entertainment is on the leading edge of this disruption given the seemingly insatiable appetite for films, television shows, books, and music—industries that depend on strong copyright protections. For instance, Sandvine reported in September 2015 that “[online] consumption in Asia-Pacific is driven by the use of Real-Time Entertainment [audio and video], which accounts for 47.2% of total downstream traffic during peak period[s]. Widespread theft is also a concern for innovative legitimate online distribution platforms. Spotify says piracy remains the greatest challenge it faces in Asia. And in a 2015 letter to shareholders, Netflix identified piracy as a major threat to its business. As a result, some stakeholders are urging policymakers to do more to address online theft. Yet as digital piracy continues to proliferate, other stakeholders are nonetheless calling for a weakening of intellectual property protections in copyright law. Exceptions and limitations to copyright’s exclusive rights—like the U.S. concept of “fair use” or the Australian and New Zealand concept of “fair dealing”—allow for the use of copyrighted works without permission or compensation for various social purposes. In the U.S., the legality of a particular “fair use” is determined by applying four subjective factors on a case-by-case basis. Alternatively, under the “fair dealing” model, specific allowed uses are spelled out by statute. In theory, both fair use and fair dealing can be broad or narrow depending on statutory construction and judicial interpretation, but in practice supporters of the U.S. model feel that fair use provides more “flexibility” to appropriate from copyrighted works without permission or compensation. Regardless of whether a country employs a fair use or fair dealing model, the key policy question remains: Where should a responsible policymaker focus her energy in reforming copyright policies for the Digital Age? Should she reduce theft by strengthening copyright protection and enforcement, or should she expand exceptions and limitations in ways that may offer some benefits but also may weaken the incentives to create new works? According to my review of the evidence and a new economic model of the U.S. fair use legal regime released today, I believe that policymakers should focus first on significantly reducing theft, and that any discussion of expanding or altering provisions related to copyright’s exceptions and limitations must be accompanied by better enforcement of copyright than currently exists. In an effort to help guide both reviews of copyright law abroad and the judicial consideration of fair use disputes in the US, we offer an economic model of fair use in a paper released today: Fair Use in the Digital Age. 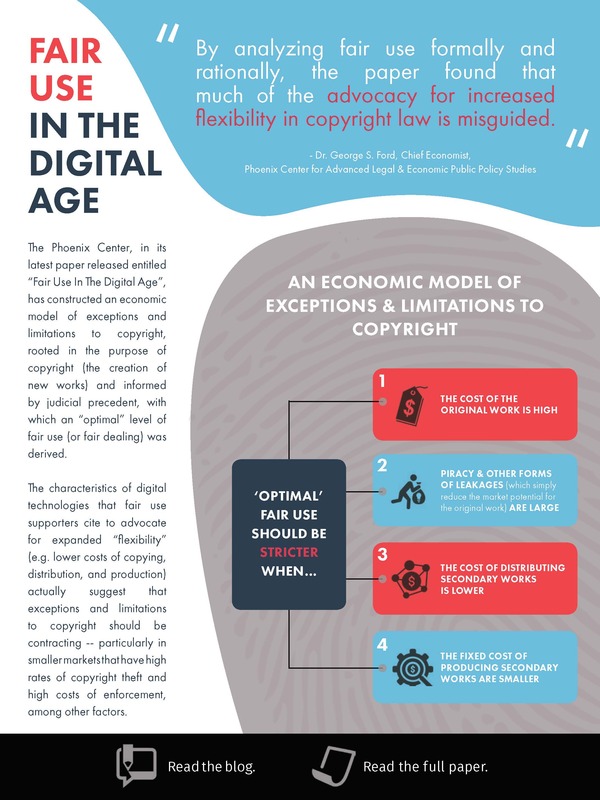 In this paper, we construct an economic model of exceptions and limitations to copyright, rooted in the purpose of copyright (the creation of new works) and informed by judicial precedent, with which we derive an “optimal” level of fair use (or fair dealing). We find, among other things, that “optimal” fair use should be stricter when: (1) the cost the original work is high; (2) piracy and other forms of leakages, which simply reduce the market potential for the original work, are large; (3) the cost of distributing secondary works is lower; and (4) the fixed cost of producing secondary works are smaller. By analyzing fair use formally and rationally, we find that much of the advocacy for increased flexibility in copyright law is misguided. The characteristics of digital technologies that fair use supporters cite to advocate for expanded “flexibility” (e.g. lower costs of copying, distribution, and production) actually suggest that exceptions and limitations to copyright should be contracting—particularly in smaller markets that have high rates of copyright theft and high costs of enforcement, among other factors. Additionally, our paper suggests, at a minimum, that the thinking on expanding exceptions and limitations requires much more research. Intellectual property laws support substantial economic activity and rouse the creative energies of humankind. Stakeholders seeking to modify them are within their rights to advocate for their favored outcomes. Emotional positions are certainly influential, but if net improvements in society’s well-being are desired the discourse on policy must eventually turn to rigorous, analytical, and credible research. Certainly, careless and stunningly unskilled empirical studies aimed at manipulating discourse about copyright laws are unhelpful, and undermine the trust between policymaker and researcher. In the absence of cutting-edge research on this important topic, both theoretical and empirical, the risk is too great for doing more harm than good. I hope our new economic model will constructively inform discourse on this important topic and encourage, if not facilitate, better research going forward. Intellectual property laws deserve nothing less. Dr. George S. Ford is the Chief Economist of the Phoenix Center for Advanced Legal & Economic Public Policy Studies, a non-profit 501(c)(3) research organization that studies broad public-policy issues related to governance, social and economic conditions, with a particular emphasis on the law and economics of the digital age.